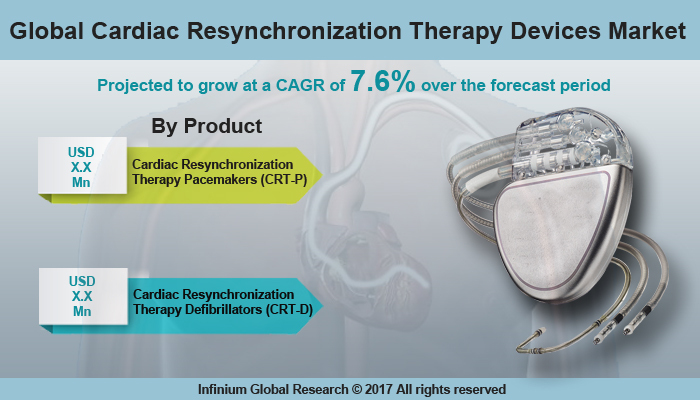 A recent report published by Infinium Global Research on cardiac resynchronization therapy devices market provides an in-depth analysis of segments and sub-segments in global as well as regional cardiac resynchronization therapy devices market. The study also highlights the impact of drivers, restraints and macro indicators on the global and regional cardiac resynchronization therapy devices market over the short term as well as long term. The report is a comprehensive presentation of trends, forecast and dollar values of global cardiac resynchronization therapy devices market. According to the report the global cardiac resynchronization therapy devices market is projected to grow at a CAGR of 7.6% over the forecast period of 2018-2024. To treat heart diseases, cardiac resynchronization therapy is used. The damage to the heart, age, genetic is the various factor that causes irregular heartbeats that are known as arrhythmias. Biventricular pacing or CRT is used to improve the rhythm of the heart and reduce the signs that are related to the arrhythmias in heart failure patients. A CRT device sends small electrical impulses to both lower chambers of the heart to help them beat together in a more synchronized pattern. The CRT device is a tiny computer, with an enclosed battery in a small titanium metal case. Insulated wires are called leads, which are implanted to carry electrical impulses to the heart and information signals from the heart to the heart device. There are two types of CRT Devices. Depending on the heart failure condition, a Cardiac Resynchronization Therapy Pacemaker (CRT-P) or a Cardiac Resynchronization Therapy Defibrillator (CRT-D). The rising incidence rate of heart diseases such as sick sinus syndrome, cardiac arrest, and bradycardia worldwide are driving the growth of CRT devices market. The demand for invasive techniques in the treatment of heart diseases is increased and changes in the lifestyle are likely to boost the growth of this market. Additional, growing geriatric patients worldwide are likely to support the growth of the market. Moreover, technological advancements and raising awareness of the CRT devices are driving the market of the CRT devices. On the other hand, surgical site infection, failure in delivering the optimum therapy when it is needed, sensitivity towards the device material are the risk associated CRT devices that are likely to hamper the growth of CRT devices market. North America is expected to be the largest market for CRT devices, followed by Europe. There is intense competition in this region. North America accounted for the highest market share owing to the presence of advance healthcare infrastructure in countries like the U.S and Canada. The demand for advanced technology, increasing growth of geriatric population suffering from cardiac and increasing awareness concerning the treatment of heart failure dysfunction has boosted the market in this region. The U.K. and Germany are the largest revenue generating countries in the Europe region. Moreover, product approval and well-established healthcare infrastructure are expected to drive the growth in the Europe CRT device market. The new product launch and investment in research and development are the key strategies of the leading player in this market. For instance, Medtronic Plc., one of the leading players, investment a huge revenue for their cardiac and vascular business units to remain up-to-date and deliver the needs of the patients. In 2016, Medtronic received approval from the FDA for two MRI-Safe CRT-D devices. The third-generation products are enabled to do MRI testing of patients implanted with these devices without the fear of incurring any complications or fatalities. In January 2017, Abbott laboratories acquired St. Jude Medical, Inc., for the future growth and to develop a varied and strong portfolio of medical devices, nutritionals, diagnostics and established branded generic pharmaceuticals. The report on global cardiac resynchronization therapy devices market covers segments such as product. On the basis of product, the global cardiac resynchronization therapy devices market is categorized into cardiac resynchronization therapy pacemakers (CRT-P) and cardiac resynchronization therapy defibrillators (CRT-D). The report provides profiles of the companies in the global cardiac resynchronization therapy devices market such as Medtronic, Abbott Laboratories, St. Jude Medical, LivaNova Plc, Boston Scientific, Biotronik, Cook Group, Inc., Johnson & Johnson and Others. The report provides deep insights on demand forecasts, market trends, and micro and macro indicators. In addition, this report provides insights on the factors that are driving and restraining the global cardiac resynchronization therapy devices market. Moreover, IGR-Growth Matrix analysis given in the report brings insight into the investment areas that existing or new market players can consider. The report provides insights into the market using analytical tools such as Porter's five forces analysis and DRO analysis of cardiac resynchronization therapy devices market. Moreover, the study highlights current market trends and provides forecast from 2018-2024. We also have highlighted future trends in the cardiac resynchronization therapy devices market that will impact the demand during the forecast period. Moreover, the competitive analysis given in each regional market brings insight into the market share of the leading players. This report will help manufacturers, suppliers, and distributors of the cardiac resynchronization therapy devices market to understand the present and future trends in this market and formulate their strategies accordingly.